Dense Wavelength Division Multiplexing (DWDM) network is regarded as the feasible solution to achieve long-distance fiber expansion. DWDM system, with the channel density of 96, has much narrower channel spacing than CWDM system, which allows extremely high utilization of a single fiber strand to pass up to many clients. 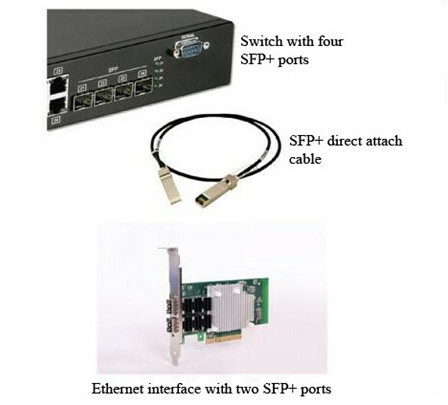 10G DWDM SFP+ modules can support a link length of up to 80km. However, the transmission distance of fiber optical network will be affected by factors like date rate, optical signal loss, etc. 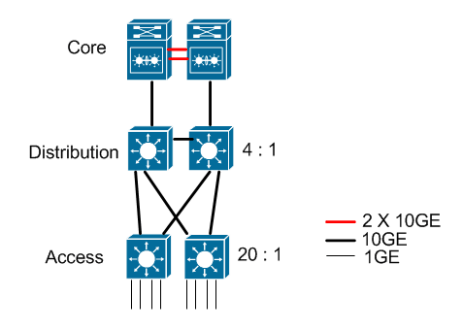 This article will introduce three instances of how to use DWDM system to extend the transmission distance of 10GbE network. DWDM uses single-mode fiber to carry multiple light waves of differing frequencies. With the advent of 10G DWDM optics, customers can easily connect up to 80 channels over a single pair of fibers for a maximum distance of 80 km without the need for complicated, bulky and expensive separate DWDM chassis systems. Figure 1 shows the basic working principle of DWDM system. The aggregated signal from the ROADM is then passed on to an amplifier to boost the signal on the outbound connection. The node may also employ a pre-amplifier that boosts an incoming aggregated signal as it comes into the node from another location, prior to passing on to a ROADM to drop or pass signals at that node. This is the ring of DWDM system. Different specifications of DWDM have different supporting transmission distances. For example, the theoretical transmission distance of 1G DWDM SFP optical modules can reach 100km, while 10G DWDM SFP+ optical module support theoretically up to 80km, so it is essential to choose a kind of optical module that meets the practical needs. However, in the some cases, we may need to extend the transmission distance of the network without replacing optical module, so that some other devices will be required to ensure the transmission quality of the optical signal. Here we will take the DWDM network of 10G DWDM SFP+ optical module as an example to explain the fact that how to extend transmission distance by increasing devices. There are two strands of optical signal transmitted between site 1 and site 2, which are operated over C21 and C50 10G DWDM SFP+ transceiver modules separately. The 80km DWDM SFP+ module can support an actual distance of 31 km without increasing other devices, and the data transmission rate can reach to 10Gbps. The light loss of whole solution is 9dB. 40CH DWDM mux/demux is needed for future proofing. 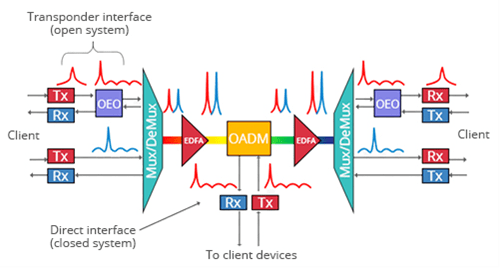 For longer distance of the DWDM network, OEO is required to transfer all the regular signals into DWDM signals to decrease the risks of fault caused by high power consumption. According to the figure 3, there are two 1G signals and eight 10G signals that are operated on different wavelengths with 80km DWDM modules between site A and site B. The actual linking distance of this layout is 57km with the light loss of 17dB.